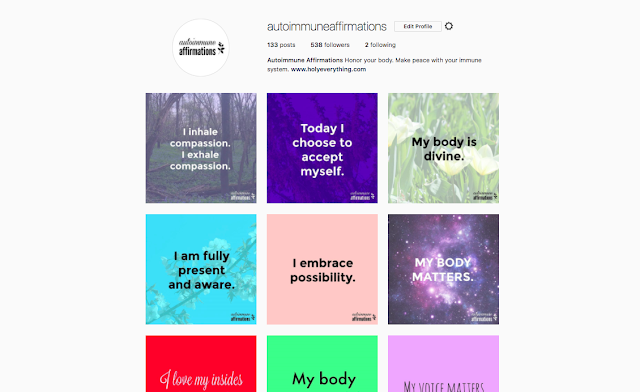 Autoimmune Affirmations is back (I guess it was always there, I just wasn't able to post as often without home Internet)! I'm planning to share several new designs each week. These affirmations are for everyone with a special focus toward those who are dealing/have dealt with a medical diagnosis of any kind. How we talk to ourselves about ourselves is a big deal! How we talk to ourselves about our own bodies and other people's bodies is also a big deal. I hope these affirmations will be a tool for you and for others as we seek to build a world of compassion. In many ways our ability to compassionate with others is directly correlated to our ability to be compassionate with ourselves.